Alice's Garden is a trampoline specialist in the UK and Europe. Thanks to our know-how and customer satisfaction, Alice’s Garden has sold over 300 000 trampolines in the last 7 years! Each one of our trampolines is tested and approved by our European team. Do you want to give your kids a present but can't think of anything that will surprise them? Well, even if it's hard to believe, there are still activities kids can enjoy that do not involve technology. Gifting your kids a trampoline is not only an opportunity for them to have fun but to exercise as well. If you are looking for something to encourage your children to exercise, this trampoline is an excellent option to start doing it at home. It is suitable for those who already exercise regularly and a great way to start for those to have not built up the habit yet. Safety of young and old is of the utmost importance to Alice's Garden. All of our trampolines are compliant with current EU safety directives. The protective cushion helps minimise the risk of scratches in the event of a fall. The safety net is closable with clips and zip to prevents falls. The yellow zip on the safety net helps you to easily find the exit in the event of an emergency. The U-shaped feet offer stability and allow the trampoline to be fixed to the ground. Our trampolines offer incredible suppleness and bounce thanks to the polypropylene (Permatron) jumping mat. The trampoline can be freely moved and re-positioned in your garden. The jumping mat is held by high-quality conical springs. 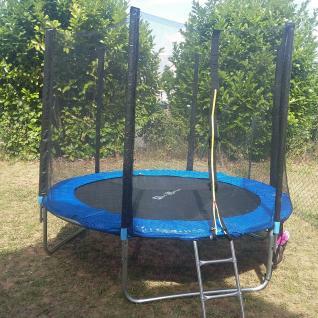 This trampoline has 48 galvanized steel spring which ensures quality and durability. All Alice's Garden trampolines are strong, sturdy and easily assembled. The stainless-steel frame ensures durability and endurance to outdoor conditions. The frame's T-connectors are square and they interlock. Each T-connector is welded and screwed together to maintain longevity and sturdiness. - At least 2 metres of free space around and above the trampoline required. - Not suitable for children under 3 years old. - Only one user at the time to avoid risk of collision. - We recommend replacing the safety net every 5 years. - We recommend fixing your trampoline to the ground with an anchor kit. Jumping mat: Polypropylene (Permatron) manufactured in the USA. Protective cusions: width 27cm, thickness 22mm.